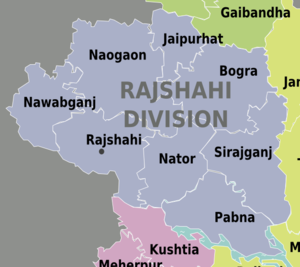 Rajshahi Division is a region in Bangladesh. Paharpur - a small village 5 km. west of Jamalganj in the greater Rajshahi district where the remains of the most important and the largest known monastery south of the Himalayas has been excavated. This 7th century archaeological find covers approximately an area of 27acres of land. The entire establishment, occupying a quadrangular court, measuring more than 900 ft. externally on each side, has high enclosure- walls about 16 ft. in thickness and from 12 ft. to 15 ft. height. With elaborate gateway complex on the north, there are 45 cells on the north and 44 in each of the other three sides with a total number of 177 rooms. The architecture of the pyramidal cruciform temple is profoundly influenced by those of South-East Asia, especially Myanmar and Java. During the Pakistan period had included Rangpur division as a district under the same name and was part of Rajshahi Division then as one of four divisions of East Pakistan. Bengali is spoken widely. English is spoken by many in the larger towns and cities. This page was last edited on 10 March 2015, at 21:42.